Philadelphia officers patrol North Simpson Street in the 19th Police District. 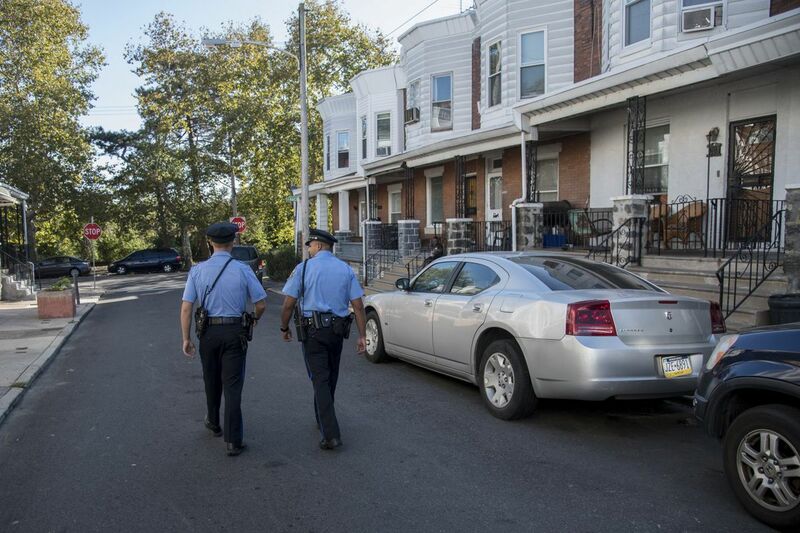 More than 1,000 Philadelphia police officers have abandoned city living since the department's residency rules were softened five years ago — many lured to the suburbs by the prospect of better schools, cleaner streets, and safer neighborhoods. The figure, based on an Inquirer and Daily News analysis of payroll data, represents about 15 percent of the nearly 6,000 eligible officers, a tally likely to grow each year. In 2010, their union won a battle to end the residency requirement for members with at least five years on the job. The rule went into effect five years ago. Firefighters and sheriff's deputies earned the same right a year ago, but most of the rest of the 30,000 municipal workers must be Philadelphians. The exodus could have been even more pronounced. The police union tried to end the requirement altogether in negotiations for the three-year pact that was approved this summer, but the Kenney administration opposed it. Among its complaints: Losing high-paid city workers — the average salary for police officers who have moved out of the city is about $75,000 — weakens the property-tax base and ultimately harms city schools. "They should hang in the neighborhoods and help make the schools better," said Mayor Kenney, a lifelong city resident who now lives in Old City. "All of our residents need to pitch in and help with our schools." Better schools in the suburbs are part of the draw, some officers say. "Unfortunately, we had to go," said a 20-year lieutenant who moved with his family to Bucks County three years ago. He asked not to be identified because he said he was not authorized to speak publicly on the issue. "I couldn't foresee taking that gamble of hoping your kid gets into a charter school" in the city. Number of police living in each zip code as of Aug. 31 (Click on the map for zip code and number of police. Click on upper-left arrow for legend). The lieutenant said dozens of his colleagues had also moved in recent years to Bucks or Montgomery Counties. The flight of middle-class public servants is not unique to Philadelphia. Many metropolitan police departments, including those in Detroit and Miami, have a majority of their force living outside city lines. Whenever residency requirements are eased or eliminated, an outcry follows about the effect on community police relations. That was the argument the Nutter administration made in 2009 after an arbitration panel approved a residency policy for Philadelphia officers that said they must remain in Pennsylvania, but need to live in Philadelphia for only their first five years on the job. But Philadelphia officers note that, given the current policy, everyone under the rank of captain is barred from living in the same district where they work. And criminal-justice experts say there are no data to support the idea that residency requirements make a difference in policing. “Researchers have looked at whether residency requirements influence patterns of misconduct or influence patterns of use of force, and pretty much by and large … there is no support for those relationships,” said Robert J. Kane, director of the criminology and justice studies program at Drexel University. Maria Haberfeld, professor and codirector of the NYPD Police Studies Program at John Jay College of Criminal Justice, said a good police officer would get cooperation of the community “no matter where you live.” She said effective policing involved emotional and social intelligence. Residency rules vary among surrounding police departments. Camden County police officers, for instance, simply have to live in New Jersey. Chester police officers are required to live in Chester City for five years after being hired, but then must live within a 50-mile radius. Chester Police Chief James Nolan said city officials preferred that employees live in Chester to help build a tax base and populate city schools. But, Nolan said, he understood why officers might want to live elsewhere. Chester, which is just five square miles, has limited housing stock, entrenched poverty, and struggling schools. Middletown Township requires its officers to live within a 25-mile radius of the Bucks County municipality. About half choose to live in Middletown, the other half do not — including the chief, Joseph Bartorilla. Bartorilla was a 23-year veteran of the Philadelphia Police Department before becoming top cop in Middletown. He still lives in Philadelphia’s Pine Valley neighborhood. John McNesby, president of the Philadelphia chapter of the Fraternal Order of Police, said many officers who moved out of the city were veterans seeking a retirement home in the suburbs. As for getting rid of the residency requirement completely, McNesby said the union just wanted officers to have the option to live in New Jersey or Delaware. Still, the number of Philadelphia officers moving out is likely to grow. Next year, an additional 200 will become eligible. For some police officers, it’s about more than the schools. Another 20-year veteran of the Philadelphia police force, who also asked to not be identified, said he moved his family to Abington Township, Montgomery County, a few years ago for the schools there. His daughter graduated from Abington High School last year — but he has no intention of moving back to the city. He said he enjoyed what he called other benefits of suburban living: clean streets, low crime, and a friendly community.